When fire gutted The Pub, a popular bar and restaurant in downtown Jamestown last year, a city police officer and a firefighter left the burning building carrying three prized artifacts: the mounted and framed football jerseys from Jim McCusker’s high school, college and pro careers. That’s how much of a community treasure James B. McCusker – known as “Big Jim” around town – was in his native Jamestown, where he earlier connected the community to the National Football League’s pre-Super Bowl years. Mr. McCusker, who died Friday at age 78 in his Jamestown home after a brief illness, carved out two distinct careers, as a football player and a popular owner of a downtown restaurant and watering hole. 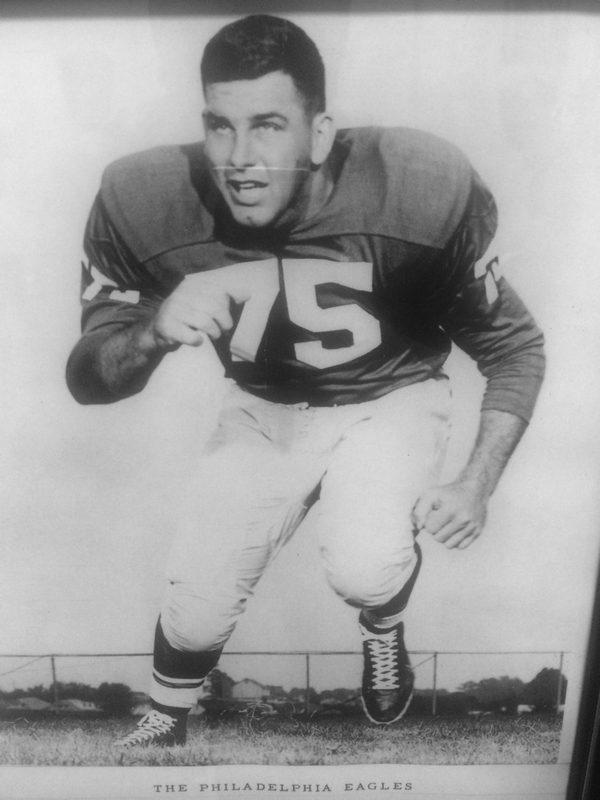 Long before that, mostly as an offensive tackle, Mr. McCusker, who was born May 13, 1936, earned all-state honors at Jamestown High School, became a three-time All-American at the University of Pittsburgh and won an NFL championship as a member of the Philadelphia Eagles in 1960 against the Vince Lombardi-coached Green Bay Packers. That was just months after the birth of the Buffalo Bills in the rival American Football League, and six seasons before the first Super Bowl. Among Mr. McCusker’s football accomplishments were his playing on the college all-star team that defeated the NFL champion Detroit Lions in a 1958 exhibition game; his key role in the Eagles’ 17-13 upset victory over the Packers in the 1960 NFL title game; and being named a charter member of the Chautauqua Sports Hall of Fame in 1982. The beefy offensive lineman – at least for his generation – played pro ball at 6-feet-2 and 245 pounds, hardly the behemoth size of today’s NFL linemen. Mr. McCusker played for the Chicago Cardinals, the Eagles, the Cleveland Browns and the New York Jets for a total of seven seasons. After his storied football career, which ended with his 1964 retirement, Mr. McCusker went home to Jamestown, opening The Pub in December 1965 and operating it for nearly 50 years at its North Main Street location downtown. Mr. McCusker was a familiar and larger-than-life figure behind the bar, as he greeted customers in his understated and gentlemanly way, longtime patrons remembered. Surviving are his wife of almost 40 years, Mary Lisciandro McCusker; a sister, Donna Mirkovich; and several nephews and nieces. Funeral services were held Wednesday in St. Luke’s Episcopal Church in Jamestown.